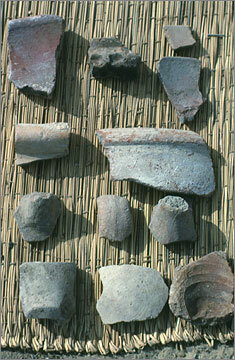 Broken pieces of pottery (sherds or potsherds) form by far the most numerous class of manufactured objects found at Amarna. 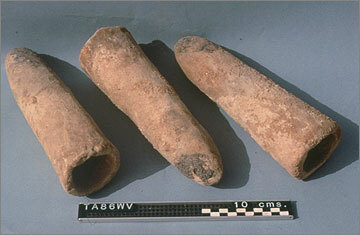 Pots were, compared to many objects, relatively large. Their material was brittle and liable to breakage into pieces which might be reduced to even smaller pieces when trampled under foot; yet pottery is also relatively resistant to complete destruction. Pots were cheap and thrown away in large quantities. Of all the kinds of objects used in the city, pots provide the most consistent and reliable record of: what? What can we hope to learn from them? The most promising approach is to accept that if we knew all the uses to which the different kinds of pots were put we would have a guide to certain kinds of human activity in the city and outside it. To give some examples. 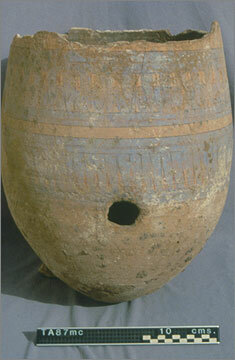 A distinctive cylindrical vessel with rounded base, coarse on the outside but unusually smooth on the inside, was used for the baking of bread (the evidence for this is compelling). Pottery bread moulds occur in concentrations in the vicinity of temples and shrines, in association with groups of rooms containing ovens. It follows that these rooms are probably bakeries, dedicated to the baking of special festival bread, on a scale that could have contributed to the general food supply of the city. The other side of the picture – the rarity of bread moulds from housing areas – does not mean, however, that families depended upon temple bakeries. We also know that the Egyptians baked a wide range of breads not made in pottery moulds, so that festival bread can have formed only a part of the city bread supply. A third example is supplied by a class of shallow bowls nearly always made in pale desert clay, with a distinctive rim and (when the base is preserved) fitted with internal loops on the bottom (and occasionally on the inside of the rim as well). Evidence which is again convincing identifies these bowls as necessary equipment in the making of the plied linen thread used in weaving. These ‘spinning-bowls’ are, in fact, the most durable evidence for this stage in textile manufacture at Amarna, and their presence throughout the housing areas helps to locate the textile industry within the domestic sphere. These are cases where a connection has been established between vessel type and usage, and the results make a valuable contribution to reconstructing the city’s way of life. With the majority of pots, however, it is not yet possible to define their ranges of use. With some storage vessels and bowls their uses might have been quite varied so that they have little extra information to impart. But it is to be expected that further study and the discovery of new contexts will, on a piecemeal basis, gradually expand the identifications and so add to the usefulness of the records made of pottery found. Complete (or near-complete) pottery vessels are relatively rare. If it is useful to know what kinds of vessels occurred in which places (and in what numbers) then it is necessary to be able to identify vessel types from fragments. Different kinds of vessels have different rims, and sometimes a particular shape is only found in a particular kind of pottery fabric. 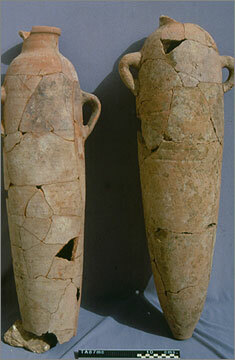 The oases amphorae, for example, used a locally identifiable clay mix. Another aspect of pottery study is thus to define the characteristics of particular kinds of vessels, paying attention to shape, fabric and surface finish, so that sherds can be matched to them. This means that sherds are evidence that is worth recording in some detail, using systems of classification for the various characteristics. 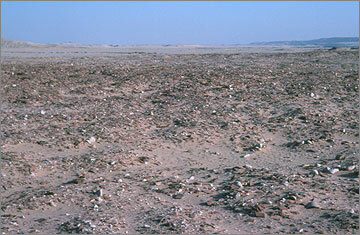 Sherds occur in very large quantities. It is not feasible to extend the recording to every single one of them. The common archaeological response to problems of scale is to work with samples. But one must be careful. Modern excavation areas are themselves only tiny samples of Amarna as a whole, and when looked at in detail, individual areas turn out to have a degree of complexity in their soil make-up that is surprising for a place occupied for only a short time. 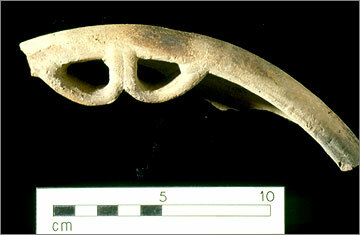 The archaeological deposits are far from uniform, and in their differing characteristics occur unpredictably. It is misleading to think that a subset of the deposits, perhaps a randomly selected sample, typifies broader areas. From the beginning of the excavations in 1979 the policy followed has been to collect (mainly through sieving) all sherds, identified by their local contexts. 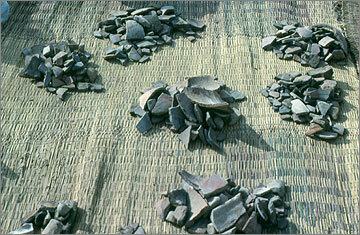 They are separated into two groups: those where there is a fair chance of making the connection with a vessel type (rims, bases and handles); and body sherds where in most cases this can only be done in very broad limits. The latter are counted and then discarded. This reduces the amount but still leaves large quantities for full recording and for permanent storage (sherds being also quite bulky and demanding of space). 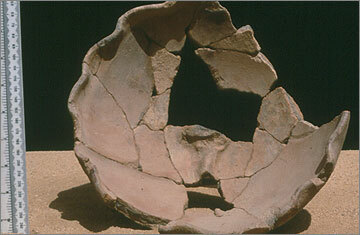 In some contexts the condition of the sherds suggests that they derive from vessels broken on the spot. There is therefore the potential for rebuilding them. The keeping of whole contexts with a view to restoration is done from time to time, based upon the judgement of the archaeologists and pottery experts. 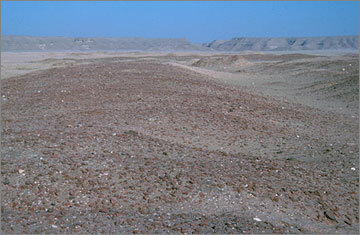 Potsherds lie on the surface of Amarna sometimes in large quantities. They are mostly there because people in the past, mostly local people digging for antiquities, have brought them to the surface. Sometimes they are the remains of ancient rubbish dumps. It is feasible to collect samples of the surface pottery and to study them in the same way as pottery from the excavations, with a view to establishing the broad distribution of pottery types across the city as a whole, and to look for distinctive clusters. The two types of record – the saturation coverage of sherds from the excavations and the spot samples from material lying on the surface – combine to create a pottery map of the whole city. To a very limited extent the pottery records from the older excavations can also be incorporated, although they comprise only relatively small numbers of complete or nearly complete vessels. The pottery map becomes a component in the general archaeological atlas of Amarna, itself one of the goals of the Amarna Project. Pots are also the products of a pottery industry. This is of interest as part of the history of technology. The making of pots was one of the industries pursued at Amarna, the remains of several potteries having been located amidst or not far from the housing areas. Certain technical characteristics that relate to manufacture are also preserved on sherds, and this is another reason for recording them in detail. 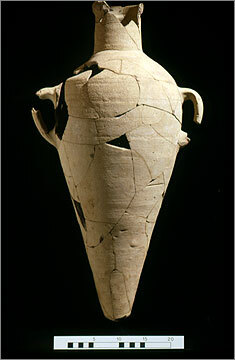 The Amarna Period occurred at a time when the painting of pottery had become far more popular than previously. 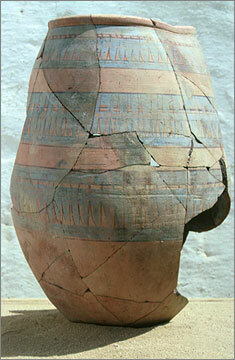 The painted vessels were mostly storage jars made from Nile-silt clay and therefore not in themselves luxury items. The dominant colour was an intense blue, accompanied by red and black, and most patterns are repeated designs in which a prominent element is stylised plant petals. 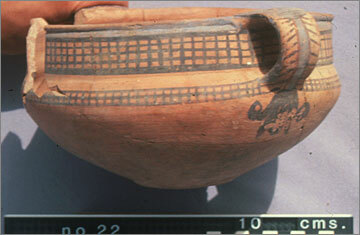 Some blue-painted vessels bore more individual motifs, such as birds and fish. This type of decorated pottery contributed to the range of bright colours that characterized life at Amarna. P.J. Rose, ‘1987. Report on the 1986 Amarna pottery survey.’ In B.J. Kemp, ed., Amarna Reports IV. Occasional Publications 5. London: Egypt Exploration Society, 115–29. P.J. Rose, 1995. ‘Report on the 1987 pottery survey.’ In B.J. Kemp, ed., Amarna Reports VI. Occasional Papers 10. London: Egypt Exploration Society, 102–14. P.J. Rose, 2002. 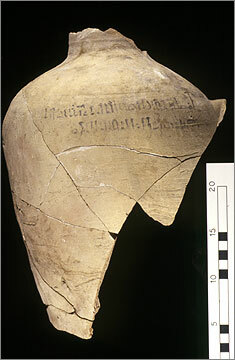 ‘”Oasis ware” vessels from Amarna.’ In R. Friedman, ed., Egypt and Nubia; gifts of the desert. London, British Museum, 109–13, 128–31. These are preliminary studies. It is important to have an authoritative system of classification for the pottery, based upon complete specimens as far as possible, which are described in detail and illustrated. 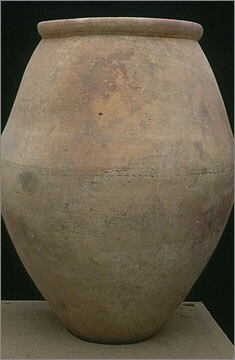 The corpus of Amarna pottery (by Pamela Rose) is now in the course of publication. Over the years, a total of around 130,000 sherds have been logged in the expedition’s database. A second volume by Pamela Rose will summarise the data, present distribution maps, and discuss the contribution to understanding Amarna life that the pottery makes.